FREMONT, CA – November 13, 2017 – Penguin Computing, provider of high performance computing, enterprise data center and cloud solutions, today announced that more than 11,500 cores of the latest Intel® Xeon® Scalable processor (codenamed: Skylake-SP) will be available in December 2017 on Penguin Computing® On-DemandTM (POD) HPC cloud. The new POD HPC cloud compute resources use Intel® Xeon® Gold 6148 processors, a cluster-wide Intel® Omni-Path Architecture low-latency fabric and are integrated with Penguin Computing® Scyld Cloud WorkstationTM for web-based, remote desktop access into the public HPC cloud service. Scientists and engineers at every company are trying to innovate faster while holding down costs. Modeling and simulation are the backbone of these efforts. Customers may wish to run simulations at scale, or many different permutations simultaneously but may require more computing resources than are readily available in-house. The POD HPC cloud offers organizations a flexible, cost effective approach to meeting these requirements. The Intel Xeon Scalable processor provides increased performance, a unified stack optimized for key workloads including data analytics, and integrated technologies including networking, acceleration and storage. The processor’s increased performance is realized through innovations including Intel® AVX-512 extensions that can deliver up to 2x FLOPS per clock cycle, which is especially important for HPC, data analytics and hardware-enhanced security/cryptography workloads. Along with numerous acceleration refinements, the new processor offers integrated 100 Gb/s Intel® Omni-Path Architecture fabric options. With these improvements, the Intel Xeon Scalable Platinum 8180 processor yielded an increase of up to 8.2x more double precision GFLOPS/sec when compared to Intel Xeon processor E5-2690 (codenamed Sandy Bridge) common in the server installed-base, and a 2.27x increase over the previous-generation Intel Xeon processor E5-2699 v4 (codenamed Broadwell) . 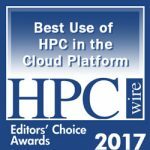 The doubling of cores in the publicly available POD HPC cloud resources in 2017 was proceeded by a 50 percent increase in capacity in 2016. As customer demand continues to increase, POD HPC cloud will continue to grow using the most current technologies to deliver the actionable insights that organizations require. Visit Penguin Computing at Booth 1801 during SC17 in Denver. Penguin Computing is one of the largest private suppliers of enterprise and high-performance computing solutions in North America and has built and operates the leading specialized public HPC cloud service, Penguin Computing On-Demand (POD). Penguin Computing pioneers the design, engineering, integration and delivery of solutions that are based on open architectures and comprise non-proprietary components from a variety of vendors. Penguin Computing is also one of a limited number of authorized Open Compute Project (OCP) solution providers leveraging this Facebook-led initiative to bring the most efficient open data center solutions to a broader market, and has announced the Tundra product line which applies the benefits of OCP to high performance computing. Penguin Computing has systems installed with more than 2,500 customers in 40 countries across eight major vertical markets.